After reading one of McEwan's short stories in the New Yorker, I felt compelled to read this. It was pretty good. Hmmmm... I was disappointed that this book was entirely predictable, but I enjoyed the part where Clive is walking in the Lakes District, and his inner monologue while he is creating music. I don't think I'll be reading more McEwan. This book goes off to Australia next where hopefully it will be appreciated a little more than it was at my house. anyway - i'm more than happy to get to read another ian mcewan book. he and paul auster have been two of my favourite authors over the last few month. maybe it will take a little while as i have three bookrings waiting to be read as well. --> @larkonapost: why did you sent this book my way? i'm confused or is it only the jetlag!? citrus - austria - europe pref. bookwormnicky - uk - national pref. i just finished this book. it was a really quick read and i think i was a little upset about the pace of it. the ending seems rushed but apart from that i liked it as a short novel inbetween. Arrived safely in Gouda. On top of Mt TBR. What starts as a fine political thriller ends in a farce. To think that it is common practice in The Netherlands to buy euthanasia is out of proportion. This idea ruined the book for me. Dispiccable! "Amsterdam" arrived today. Thank you. Well... I started to read the book. And then started again. I'm very sorry - I tried, but I couldn't get through the story. 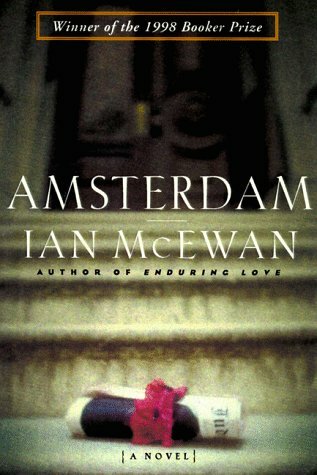 Normally, I really like Ian McEwan, but this time I couldn't finish the book.